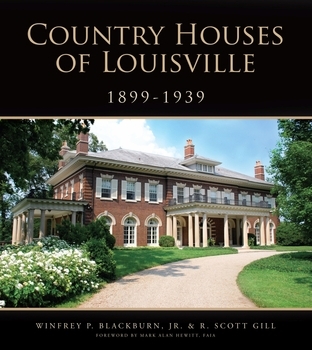 Country Houses of Louisville, 1899-1939 presents an in-depth view of 32 spectacular country estates in Louisville, Kentucky, and the families and architects who built them. Focusing on houses constructed in Louisville around Frederick Law Olmsted's Cherokee Park and along the bluffs overlooking the Ohio River, the book features works by distinguished local and national architects and landscape architects whose work in Kentucky is not widely known. This period and genre of residential architecture and related social history in Louisville have never before been documented this thoroughly or extensively. The book is based on extensive new research that has delved into private family archives and institutional collections from Kentucky to Chicago to New York to Boston to Maine. It includes over 300 contemporary and archival illustrations, a great number of which are being published for the first time ever. The book also includes images of homes that were long ago demolished and, in many cases, forgotten. NOTE: The authors' previous book, Kentucky Houses of Stratton Hammon, won a Bronze Medal in the Architecture Category of the national Independent Publisher Book Awards in 2008. Winfrey P. Blackburn, Jr. is a practicing attorney in Louisville. He is a native of Frankfort, Kentucky, and holds bachelors and law degrees, with honors, from the University of Virginia. R. Scott Gill is a former resident of Louisville, presently living and working in real estate in Chicago. He holds a bachelors degree in history from Stanford University, a master of architecture degree from Rice University, and an MBA from the Massachusetts Institute of Technology.